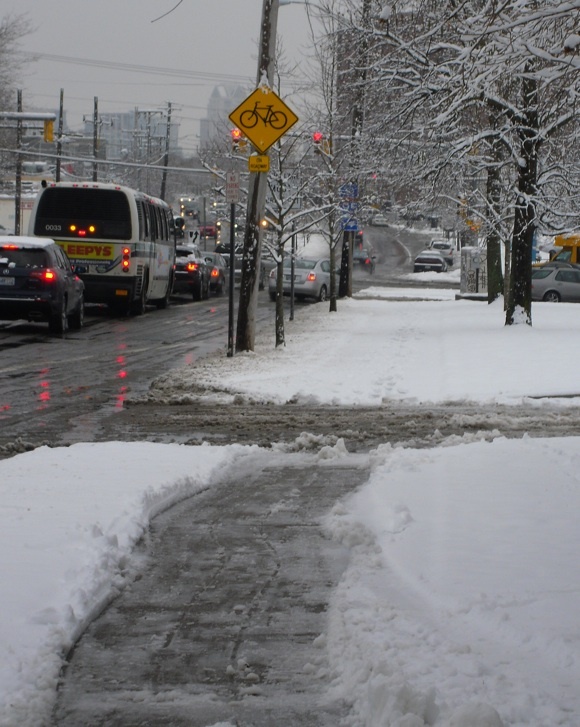 Here are some snowy sidewalk pics that illustrate the not-my-job mindset. I am glad the long sidewalk along North Burial Ground on North Main Street has been getting plowed lately, although when the snow is deep enough to bog down their little tractor, they simply fuggedaboutit. But how hard would it be to drive that little tractor a few yards farther along and clear the traffic island at Cemetary Street? On a side note, this intersection is a fine example of inappropriate high-speed design. Oh yeah, there is a stop sign, but most drivers scoot right on through and merge into N. Main at full speed, with heads turned left to check approaching traffic as if they were at a highway on-ramp instead of a crosswalk. 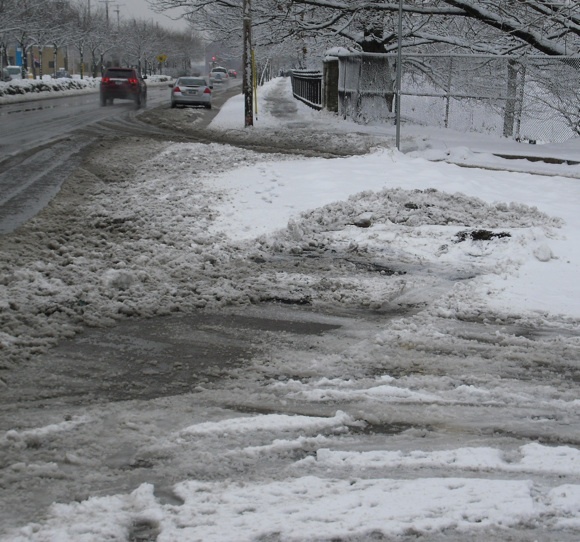 Also, note how the sidewalk on the traffic island is where the plow driver who clears the lawyer’s lot dumps snow. I guess it a dead-serious matter of turf and good fences between Parks Dept and Public Works, (or RIDOT? Or the Feds? N Main is US 1, you know) that keeps the Parks Dept. tractor from plowing all the way to Branch Ave. It might take 90 seconds and cause huge paperwork and budget issues. If you look at the city’s parcel map the little area between the gates and N. Main are part of North Burial Ground. So they should be plowing the sidewalk down to Branch Ave and then along Branch all the way to the entrance to Rte 95.